Facebook Zero is a very successful project that increased the number of mobile Facebook users mostly because they could browse for free. Google tries something similar by launching Free Zone, a service that lets you use Google Search, Gmail and Google+ on your mobile phone for free. For now, the service is only available in Philippines and only for Globe users, but that's because Free Zone is still an experiment. "When you use these Google products through Free Zone on your mobile phone, you won't be charged for data. You can use Free Zone even if you haven't subscribed to a data plan with your operator. 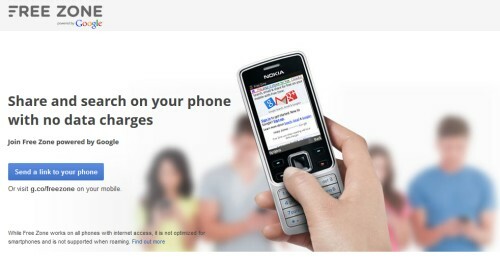 You can access Free Zone using any default phone browser. Sign in to your Google Account at http://g.co/freezone with your mobile phone in order to use Google Search, Gmail, and Google+. Free Zone should be accessed using your phone's default browser. Third party browsers (such as QQ, Opera Mini and Bolt) are not supported," informs Google. "Since using Google+, Gmail, and Google Search is free through Free Zone, there is no limit to the amount of data you use for these Google products. You're also not charged for any links that you click on from the search results page. Important: When using Search, the page you access after clicking on a search result is free. However, if you click on a link within that article — or if a link takes you outside of Google+ or Gmail — you'll be shown a warning page alerting you of any potential charges." Free Zone is optimized for feature phones, but it also works on smartphones. You only need to change your APN settings. If Google's description is accurate, you can use Free Zone to open almost any web page: just type the URL in Google's search box and select the first result. Isn't it kind of pointless though if you can use Google search for free but not any of the websites you find while using it? "Important: When using Search, the page you access after clicking on a search result is free. However, if you click on a link within that article — or if a link takes you outside of Google+ or Gmail — you'll be shown a warning page alerting you of any potential charges." Cool! Can't wait to try this! Facebook Zero is a light-weight, text-only version of facebook.com that omits data intensive applications like Photos. It was announced in February 2010. It intends to make Facebook on the mobile web available to everyone, anywhere and allow operators to encourage more mobile Internet usage. How this facebook zero application is managing the services at free of cost? Very Amazing, hope this will be available in out country soon.